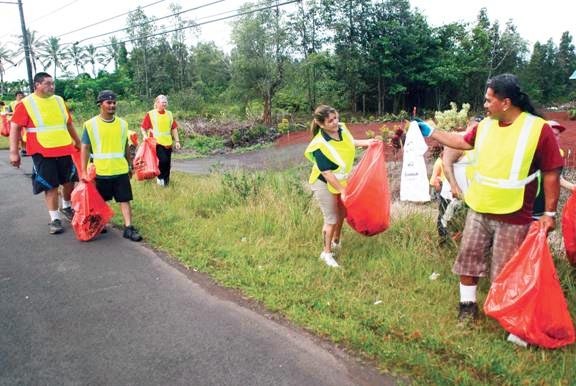 Volunteers pick up trash along Highway 130 in Puna during a coordinated "Adopt a Highway" project on August 25. The Hawaiʻi Police Department, in cooperation with the Department of Transportation’s State Highways Division and local community organizations, conducted a coordinated “Adopt a Highway” cleanup project on Saturday (August 25) along Highway 130 in the Puna District. 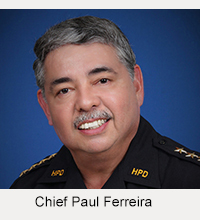 More than 100 volunteers from seven community groups participated, along with Puna Community Policing Officers William Brown, Scott Amaral and Sandor Finkey. The cleanup was conducted from 7 a.m. until just after 11 a.m. and spanned the stretch of Highway 130 from the Humane Society all the way to Pāhoa Village. 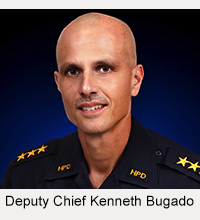 Police encourage any group or member of the public who wishes to participate in future projects to call Community Police Officer Sandor Finkey at 965-2716.